Only recently did I start cooking with preserved lemons. How did I ever do without it! Actually, it was my husband who picked it up on our last grocery trip. Trust him to find the most unusual foods in the city. Once, before this, he had brought home chocolate covered edamame. Chocolate covered edamame! It doesn't sound right, does it? My initial hesitation gave way to delight and gratitude as we now have added something different and enticing to our pantry. Preserved lemons are common in Middle Eastern and Moroccan dishes. When I found out that it is used as commonly, and with the same frequency, as we in the west use standard flavorings such as garlic onions, and celery, I shamelessly have been cooking with it almost every day. It has a strong flavor so a little goes a long way. For example, I would recommend one third of a lemon to flavor enough bean stew for two people. Nothing pairs better with fish than citrus. Sometimes, just a couple tablespoons of lemon juice and salt and pepper are all that's needed. Since this was going to be part of our Good Friday dinner, I thought I 'd add a few extra, albeit simple, ingredients. Namely garlic and extra virgin olive oil. However, it was the preserved lemons that made this dish, bringing all the flavors together. Wisely, I have learnt to trust my husband's taste; his finds usually become permanent ingredients in our kitchen. 2. Arrange the fillet skin side down on a well greased baking dish. 3. Grate the garlic into a mixing bowl, add brine liquid and olive oil. Whisk; it will thicken and emulsify almost immediately. Brush most of this emulsion over the entire fish, reserving about a teaspoon. 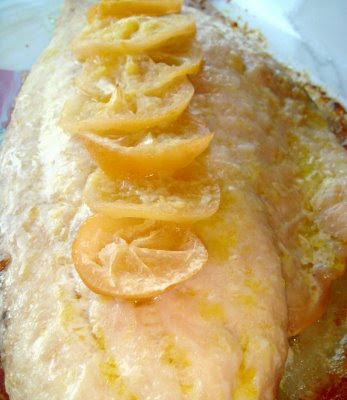 Arrange the lemon slices on top of the fish. Cover the baking dish with aluminum foil, sealing the edges tightly. Bake for 10 to 12 minutes until cooked through. Remove the foil, brush on the remaining lemon-olive oil dressing and return to the oven, uncovered. This time turn on the broiler and cook for another three or four minutes until edges turn brown. Serve immediately. Note: Preserved lemons can be found at Whole Food stores, and at other specialty food stores. If you want to make your own, there is a simple recipe over at Simply Recipes. Of course, this recipe is just as good with fresh lemons and lemon juice. This looks absolutely delicious! Now, I just need to pick up some preserved lemons and I'm all set. Tangled Noodle, that reminded me to include a couple suggestions on where you can buy those preserved lemons. I know you live in the twin cities, so Whole Foods has it, so does the Holy Land on Central Avenue. Hope you get to try this recipe. Cheers!